Vetiver Grass plant, Vetiveria zizanioides, is sometimes known as Khus Khus. Valuable for moisture conservation, erosion control and mulch. This species is a non seeding type researched in Queensland by the DPI. The aromatic root yields a volatile and valuable oil used in perfumery, cosmetics and soap. The oil is valued in aromatherapy and the root is used as a fixative in pot pourri and crafts. An infusion of the rootlets is a cooling tonic tea. The roots and their oil are used as a remedy for nervous conditions, circulation problems and rheumatism. The grass dried and made into cigarettes is a Traditional African treatment for headaches; only a small amount required. Vetiver soothes nerves and builds Chi energy. The oil from the root is also a moth, flea and cockroach repellent. 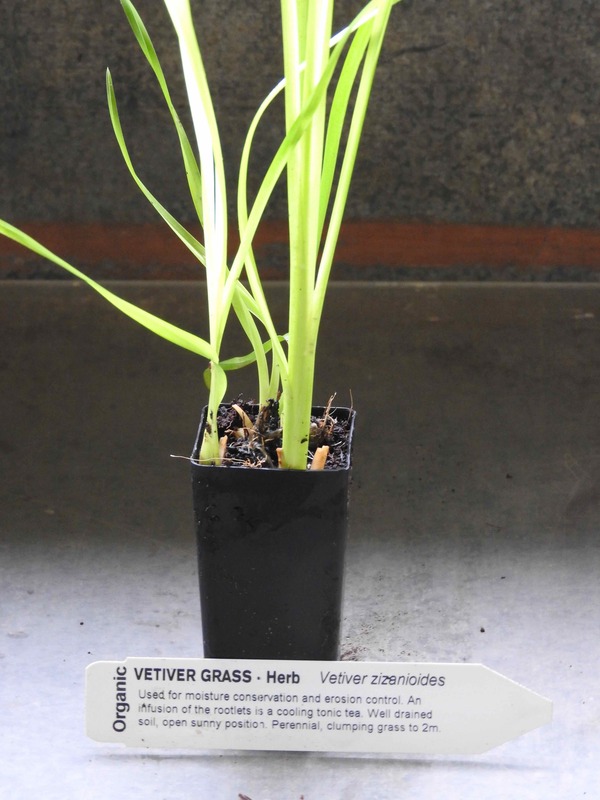 Vetiver Grass plant is native to tropical Asia and prefers moist, well drained soils in an open sunny position. Drought and frost tender. A perennial, clumping grass growing to a height of 2m. Be the first to review “Vetiver Grass, plant” Click here to cancel reply.